Lyme disease is a mysterious, often undiagnosed disease, afflicting countless thousands of unsuspecting souls across North America. It is carried by ticks, much like malaria is transmitted by mosquitoes. Since the tick bite is the source, it's worth knowing the facts about ticks, and the role they play in this debilitating disease. You can't feel the tick crawl on you. Creepy but true. Ticks numb you before biting. You may not find one unless someone sees it. 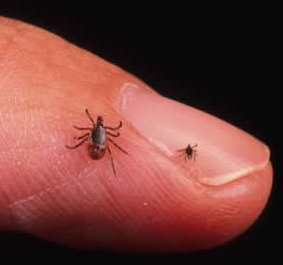 Only about 20 percent of Lyme disease victims find a tick. In the outdoors, ticks climb onto grass tips or leaves, extend their front legs, and wait to ambush. Ticks follow your breath (CO2) and track you down. Lyme disease occurs most frequently during the summer months when the nymph form of the tick is active. A nymph is about the size of a sesame seed or pencil tip. Ticks can only crawl, they cannot hop or fly. Ticks feed on many animals. Common hosts are dogs, cats, squirrels, rabbits, raccoons and birds. Birds play an important role in spreading ticks around the country. Ticks transmit infection only after attaching and taking a blood meal from their host. Normally, the tick needs to be attached for at least 24 hours to transmit Lyme. When you find a tick that is still flat and tiny and not engorged with blood, it has not transmitted Lyme disease. Lyme is everywhere in this country, not just in certain regions. It's in Canada, too. Lyme disease can cause autism. Most people don't get the bulls-eye rash. The pathogen that causes Lyme disease is a large, virulent spirochete bacteria. These corkscrew spirochetes drill into you. A mass of spirochetes can form a cyst to avoid eradication by antibiotics. When Lyme invades the heart, brain, or other vital organs, it can be deadly. Stiff, cracking or painful neck. Invasion of joints by spirochetes (arthritic symptoms). Mental fogginess, confusion, panic attacks, memory loss (Autism symptoms, Dementia). If you suspect Lyme disease, try our Lyme Disease Symptom Survey. When you are headed outdoors where ticks may be present, dress like a dork. Tuck your pants into your socks. Wear a hat. Make it as difficult as possible for ticks to reach your skin. While walking in the woods, when you brush against trees or bushes, shake or brush yourself off. In the summer and fall, when you have been in a wooded area, or a place where ticks may live, strip your clothes when you come inside. Look and feel for a sesame-size creature. It may seem more like a little mole or skin tab. If possible, have someone help you inspect. Take tick out gently with tweezers, pulling gently backwards, grasping the tick as closely as possible to the mouth parts to avoid leaving the head embedded in the skin. Pet supply stores sell a simple tick removal tool. Save the tick in a sealed jar for identification.